If you’re looking to add a personalized element to jewelry, Etsy’s one of your best bets. The online marketplace carries a vast selection of cool, affordable, custom-made pieces, like hand-stamped earrings and monogram bracelets, but oftentimes, navigating through so many shops can be time-consuming. That’s why we did the hard work for you! Check out our picks for the best customized jewelry available on Etsy. Scroll down for 14 stunning jewelry picks that you can personalize! Now this is the kind of algebra we can get behind! 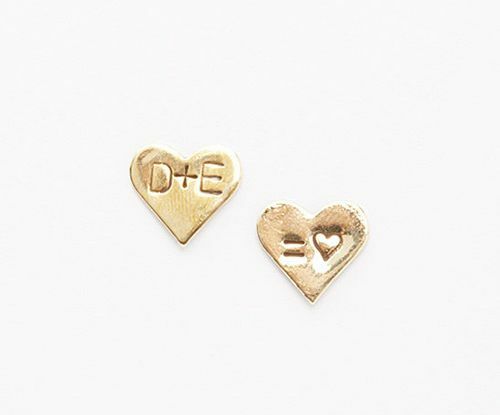 These playful heart-shaped studs can be customized with the love equation of your choice. This aluminum cuff, which also comes in bronze and copper, is lightly hammered for a cool textured look. Inscribe it with anything from a name to a meaningful date up to 14 characters. 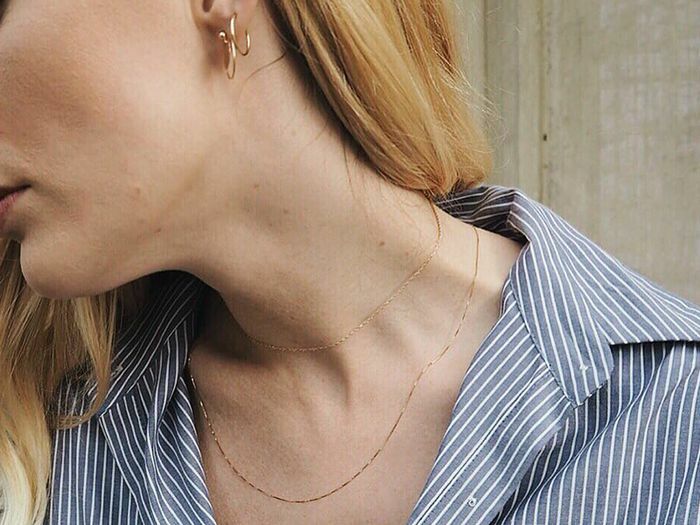 Choose from different metals, like sterling silver, rose gold, or gold, and varying lengths to fully customize this understated sideways initial necklace. Looking for the perfect gift for your best friend? Try this set of slim brass bangles, which includes a triangle charm that can be stamped with any initial. We love the idea of wearing just a single earring for an intriguing, slightly off-balance look. This designer will customize a rose gold stud with your name. If a preppy monogram is more your style, try this classic bracelet. You can choose from several different fonts, from an intricate interlocking script to a more playful, modern version. This sleek bracelet, handcrafted from vintage-looking metal, is adjustable, so you can wear it slightly open or tightly closed. There’s something charming about the lowercase letter pendants on these pretty bracelets. Stack a few of them on your wrist for a stylish, layered look. You can get up to 14 characters engraved on this hand-hammered, solid brass ring. The designer purposely skews the lettering to give it more character, though you can request that the script remain centered. This rose gold bracelet already comes with a sweet message, but you can opt to customize it with your own, up to 20 characters, by messaging the San Diego-based designer. Personalize these minimalistic gold-plated bar studs with the initials of your choice. The open design of this sterling silver ring ups its cool factor. Do you shop on Etsy? What do you shop for the most? Let us know in the comments!